Just 70 years ago, Rochester was still laced with no less than 14 electric railway transit routes. Most of these routes were formed by through-routing of two lines that terminated in downtown and reached outward to surrounding neighborhoods. These were: Lake-Monroe (route 1); Main E.-Arnett (route 2); Park (route 3); University-West (route 4); St. Paul-South (route 5); Webster-Lyell (route 6); Clinton North-Clinton South (route 7); Parsells-Genesee (route 8); Hudson-Allen (route 9); Dewey-Portland/Sea Breeze, Durand Sub (route 10); Clifford-Joseph (route 11); Central Park-Jefferson (route 12); Goodman (route 14); Subway, Dewey surface-Subway line (route 25). 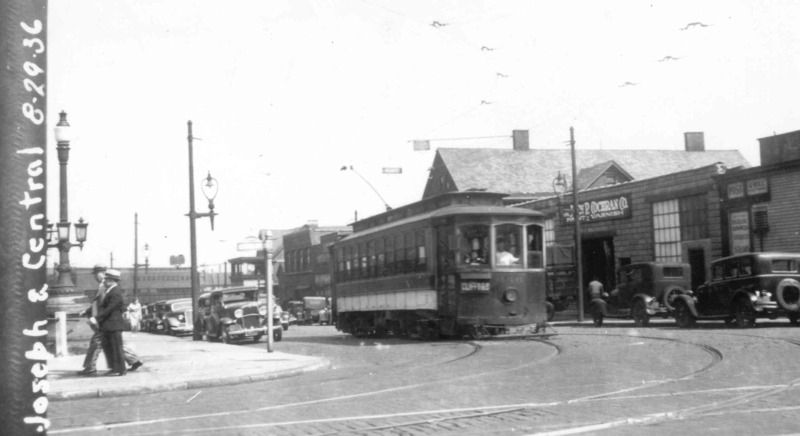 The important Plymouth South streetcar line had been converted to bus operation in 1929, as had the lesser Emerson, Driving Park and Exchange lines. And, no extensions to Rochester’s streetcar system had been built since 1923. As late as 1936, though, Rochester remained mostly a streetcar city, with buses used mostly on extensions to outlying areas in support of the core streetcar operation. All this changed with a bang in August, 1936. Seeing that its elderly equipment, track and overhead needed vast repairs and improvements to remain competitive, New York State Railways sought and obtained permission to run buses in place of eleven streetcar lines in Rochester. The first to go was the short Durand Stub, which ran out its last miles from Sea Breeze to Durant-Eastman bath house on August 23. More lines expired the next weekend, with the last full day of operation being Saturday, August 29; the last runs on some or all of these lines would have been made in the early morning hours of August 30. Gone after that were the Webster, Clinton South, Hudson, Allen, Sea Breeze, Clifford, Joseph, Central Park, Jefferson and Goodman Streetcar lines, ten in all and nearly half of those that had been running. It was the beginning of the end of streetcars in Rochester; in just five years, all remaining electric transit lines save for the Subway would be converted to bus operation. Our photo shows car 446 (Kuhlman, 1904), from the same lot as NYMT’s car 437, southbound on Joseph Avenue at Central Avenue signed for Clifford. A New York Central passenger coach can be seen in the background. Rochester railfan George Slyford probably made this photo; at least, it looks like Slyford’s style of inked notation at left on the area of the trolley pole in the foreground. Slyford was an acquaintance of Steve Maguire, and may have traded the negative of this scene to Maguire. NYMT member Shelden King purchased this print directly from the now-deceased Maguire many years ago, an act which preserved for us now the only known scene of the last full day of those ten Rochester streetcar lines.